John Krige. Sharing Knowledge, Shaping Europe. Cambridge and London: The MIT Press, 2016. ISBN: 9780262034777 (hardcover, $33.00/£27.95). Jayita Sarkar, Or Rabinowitz and Alex Wellerstein all stress the distinctive significance of Krige’s work. Standing at the crossroads between Science and Technology Studies and diplomatic history, Krige is uniquely qualified to try and bridge the gap between two disciplines that rarely talk to each other. He does so with an innovative study that looks at how the U.S. tried to divert any nuclear research in Western Europe by encouraging its allies to develop alternative forms of scientific investigation All three reviewers highlight the originality of this contribution, as Krige is the first to have introduced—and scrutinized in depth—the concept of ‘positive disarmament’ as a tool of U.S. foreign policy. Scientific cooperation and technological hegemony, Krige argues, allowed the U.S. to frame and shape how the European allies carried out scientific research in their own countries—either separately or jointly, as demonstrated by the case of the European Atomic Energy Community (EURATOM). Krige’s conclusion—namely that non-proliferation studies must expand beyond the diplomatic level and engage with the complex world of the transnational circulation of knowledge—will provide an important, if controversial, point of reference for any future research on these matters. Beside common praise, each reviewer also offers specific comments. Sarkar finds two minor problems with the book. The first, she thinks, is that it focuses only on Western European countries with close ties to the U.S., which made it easier for Washington to influence their decisions. While pointing out that this is not “a flaw” in the book, Sarkar also adds that she would have preferred if the author had made clearer “the current limitations of scope and adaptability” of the book. By limiting the number of his case studies to the highly industrialized Western European states, Sarkar argues, Krige provides a most useful tool but also one which is potentially limited by its geopolitical scope: could the policy of ‘positive disarmament’ also work on adversarial proliferators? Sarkar’s second criticism points out at a gap in the book’s narrative, which skips the administration of John F. Kennedy. Such a decision, she argues, calls for an explanation, as the book focuses mostly on the administrations of Dwight Eisenhower and Lyndon Johnson. This hiatus is particularly relevant, from her point of view, as some of the recent literature on non-proliferation emphasizes the long-term continuity of U.S. non-proliferation policy. While also offering a very positive assessment of the book, Ori Rabinowitz shares part of Sarkar’s criticism about its geographic scope, and she makes clear that she would have liked Krige to extend his analysis to a neutral country like India and a non-European ally such as Japan. She also adds that the book could offer a bit more in terms of contextualizing its contents. Above all, she seems to feel that Krige should have engaged more directly with the theoretical literature on the role of technological transfer in promoting nuclear proliferation. Finally, she is critical of the specific chapter on the British decision to withdraw from the European Launcher Development Organization (ELDO), which she thinks offers a limited contribution to the overall conceptual architecture of the book. Sarkar and Rabinowitz both focus mostly on the implications of Krige’s work for non-proliferation studies. Wellerstein, on the other hand, also looks at the broader picture of what U.S. technological diplomacy meant for European integration. As he points out, at the beginning of the Cold war the U.S. faced a crucial question: how to harness the scientific and technological prowess as well as the security dilemmas and the national aspirations of the European allies in a way that was consistent with U.S. strategic objectives. Sponsoring European integration turned out to be the way to kill two birds with one stone. By promoting “supranational organizations that would be dedicated towards peaceful technologies,” the U.S. hoped to stimulate stability among the European countries while also retaining control over their scientific development. While Wellerstein acknowledges that Krige himself is fully aware of the shortcomings and the limits of the American efforts, he seems to be more skeptical than Krige is that these U.S. policies actually worked. The book, he concludes, is really a demonstration of the limitations of such an approach. That may or may not be the case. Nevertheless, all three reviewers seem to share a deep appreciation for what Sharing Knowledge, Shaping Europe has to offer in terms of a most sophisticated and truly innovative analysis of an important aspect of the history of U.S. foreign policy. John Krige is the Kranzberg Professor in the School of History and Sociology at the Georgia Institute of Technology. His research focuses the mobilization of science and technology as instruments of U.S. foreign policy in the Cold War. His works include American Hegemony and the Postwar Reconstruction of Science in Europe (The MIT Press, 2006), and an edited collection with Naomi Oreskes, Science and Technology in the Global Cold War (The MIT Press, 2014). He is currently writing a book with Mario Daniels (Georgetown University) on export controls as instruments to regulate the circulation of knowledge in Cold War America. His edited collection of articles on Writing the Transnational History of Science and Technology is under review with a major academic publisher. Leopoldo Nuti is Professor of History of International Relations at Roma Tre University, Co-Director of the Nuclear Proliferation International History Project, and President of the Italian Society of International History. He has published extensively in Italian, English and French on US-Italian relations and Italian foreign and security policy. His latest books are La sfida nucleare. La politica estera italiana e le armi nucleari, 1945-1991 (Bologna: Il Mulino, 2008) [The Nuclear Challenge: Italian Foreign Policy and Atomic Weapons, 1945-1991] and, as a co-editor, The Euromissiles Crisis and the End of the Cold War (Stanford: Stanford University Press, 2015). Or (Ori) Rabinowitz is a tenure-track lecturer at the International Relations department at the Hebrew University of Jerusalem. Her research interests include nuclear proliferation, nuclear history, and Israeli-American relations. Her book, Bargaining on Nuclear Tests was published in April 2014 by Oxford University Press. She has since published articles in International Security, Journal of Strategic Studies and The Bulletin of the atomic scientists, in addition to comment pieces in the Washington Post and Ha’aretz. She holds a Ph.D. degree awarded by the War Studies Department of King’s College London, an MA degree in Security Studies and an LLB degree in Law, both from Tel-Aviv University. She is currently conducting a study on Israel’s failure to establish civilian nuclear infrastructure, funded by the Israel Science Foundation. Jayita Sarkar is a Research Fellow with the Security Studies Program at Massachusetts Institute of Technology. From the fall of 2017, she will be an assistant professor of international relations at Boston University’s Frederick S. Pardee School of Global Studies. Her expertise is in the history of U.S. foreign policy, nuclear proliferation, export controls, the global Cold War and South Asia. Alex Wellerstein is an Assistant Professor in the Program on Science and Technology Studies at the Stevens Institute of Technology in Hoboken, New Jersey. He received a PhD from the Department of the History of Science at Harvard University in 2010, and a BA in History from the University of California, Berkeley, in 2002. He is currently working to complete his book on the history of nuclear secrecy in the United States, from the Manhattan Project through the War on Terror, under contract with the University of Chicago Press. He is the author of Restricted Data: The Nuclear Secrecy Blog, the creator of the online NUKEMAP nuclear weapons effects simulator, and is an occasional contributor to The New Yorker’s Elements Blog. The United States has been trying for decades, with varying degrees of success, to curb the spread of nuclear proliferation around the globe. One of the first episodes related to these historic attempts transpired in West Europe in the first two decades following the conclusion of World War II. As opposed to more recent attempts to develop nuclear weapons, conducted by developing countries with limited scientific infrastructure, like Iraq and Libya, Western European countries at the time presented a different case. The countries involved were developed countries, which had access, in many cases (though not all), to advanced technologies and scientific knowledge in many nuclear related industries. The question which preoccupied American policy makers in the late 1950s and the 1960s was how Washington could go about convincing its continental allies that nuclear weapons and their related technologies should not be pursued in Europe, while at the same time developing an American nuclear arsenal. Success at this endeavor, in the European front, as we know, was relatively limited. France joined Britain in insisting on ‘going nuclear’. West Germany (FRG), and to a lesser extent Italy, present more complicated cases, where an array of U.S.-led efforts contributed to their respective decisions to abandon the nuclear path. This is where John Krige’s new book Sharing Knowledge, Shaping Europe, comes into play. The book, which uses primary sources from several archives in the U.S. and Europe, provides an important contribution to the current debate on the role of technology transfers in the spread of nuclear weapons, and in the context of nuclear history in general. Krige’s account successfully bridges two realms which are too often separate, the scientific-technological sphere and the political-science oriented non-proliferation sphere. In this respect, Krige masterfully manages to convey the sensitivities involved in the relevant technologies to the non-expert reader, while not compromising the depth of the analysis. The first two chapters of the book focus on the inception and the creation of Euratom, the European Atomic Energy Community, and together they comprise a single thematic section. They are also relatively more ‘dense’ in technical and legal details compared with the other chapters, each of which focus on a single topic. The section discusses how Washington promoted the establishment of this agency, in a move which underlined European integration as an instrument of nuclear non-proliferation. According to Krige, several approaches to managing civilian nuclear issues were explored between 1955 and 1956, and while the State Department wanted to utilize scientific knowledge-sharing as a tool to promote European integration, the United States Atomic Energy Commission (AEC), on the other hand, feared the move would result in ‘leaking’ technologies to the French via Euratom. In the American view, Euratom was meant to contribute to “general integration” of the recently mended continent and “help tie Germany ‘organically to the West’” (40). The Americans planned to use their technological advantages “as a political weapon” to achieve these objectives (41). These efforts were highlighted by fears of a West German nuclear bomb. Initially, the American establishment was not against Europe “going nuclear” per se, so long as this happened “within an integrated framework” (45). Just as the French and the Germans were withdrawing from the project, the American efforts to construct a joint program for nuclear power received some unexpected external assistance, the form of the ‘Suez debacle’ and the two first Sputnik launches (49). The French insistence on developing nuclear weapons, and Germany’s insistence on greater control over fissile material, resulted in the formation of an organization which was a far cry from its original founding vision. The following chapter explores bilateral space cooperation as a form of so called ‘positive disarmament’, an American effort to tempt advanced states into investing in space, rather than nuclear, technologies. This chapter makes a substantial contribution to the current non-proliferation literature as it sheds light into how co-operation in space technologies was conceptualized as a ‘carrot’ to be given to states willing to divert efforts away from their nuclear programs. Here too, success was limited. Krige notes that a similar tactic was employed with India and Japan, and though the topic is outside the scope of the study, some additional discussion of these two cases would have enriched the account. The following chapter explores Britain’s decision to first withdraw, and then remain in ELDO, the European Launcher Development Organization in 1966, and is the weakest analytical chapter. According to this chapter, the British wanted to withdraw from this agency for economic reasons, and decided to reverse their decision once they discovered that they would incur costly fines. The contribution of this chapter to the overall framework is relatively marginal, though it interestingly describes how the British saw the American “technological assistance as a trap” aimed at enabling the Americans to “control” British “freedom of action” (117). The subsequent chapter explores aspects related to centrifuge development, and namely focuses on the British attempts to develop an indigenous centrifuge program, and collaborate with the Germans and the Dutch, all the while not breaching an existing agreement with the U.S. which forbade utilizing knowledge gleaned from the Americans. The American scientists who inspected the British centrifuge designs thought they were “primitive,” and consequently decided to give the British carte blanche and formally declare that they had indeed honored the agreement, despite glaring evidence to the contrary. Since the British technology was inferior, it presented no commercial threat. (144-145). The book’s most interesting conclusion relates to the limits of the utility of technology transfers as an instrument of diplomacy and ‘soft power.’ The study underlines the fact that the attempts to use technology denial with allies may be effective, but simultaneously they run the risk of encouraging the recipient to either develop the required technology independently or buy it elsewhere. While in the 1950s and the early 1960s the nuclear commercial market was indeed limited, things have drastically changed since. As a point of criticism, it would have been helpful to situate these conclusions in the broader on-going debate on the role of nuclear assistance and transfer of knowledge and to contextualize them. How do they interact with the research which underlines the role of civilian nuclear assistance or sensitive nuclear assistance with the spread of nuclear weapons? How do they interact with other studies which suggest that technology transfers are not as important to successful proliferation compared with the bureaucratic infrastructure of the recipient state and its competence? The book also touches upon an intriguing historical episode which deserves some further research, as mentioned above. According to Krige, the U.S. was pursuing ‘positive disarmament’ initiatives vis-à-vis Japan and India. Since Japan stayed non-nuclear, while India went on to become nuclear, it would be interesting to explore the role of the policy in this context. All in all, Krige’s book will appeal to anyone interested in nuclear proliferation and the transfer of knowledge, and will no doubt open the door to several related discussions. John Krige’s most recent book on U.S. nonproliferation policy during the Eisenhower and Johnson years re-introduces the significance of technology and the technological tools of diplomacy in U.S. foreign policy. This is not the maiden attempt at explaining nuclear politics by Krige, a historian of science and technology by training. Far from it. He has shown time and again what scholars can learn from the technological variables of nuclear proliferation and nonproliferation—variables rarely given priority in security studies. In Sharing Knowledge, Shaping Europe, Krige demonstrates the complex range of technology-driven policy tools adopted by U.S. policymakers to attain nonproliferation goals with respect to West European allies. His book is an exploration of what he calls “positive disarmament” (80) or the deliberate policy to prevent proliferation by redirecting the nuclear ambitions of the proliferators by diverting financial, industrial, and human capital away from dual-use nuclear programs to technologically advanced but peaceful alternatives like satellite programs (instead of rocketry and missiles). Krige argues that this technological substitution strategy has been at the core of U.S. nonproliferation efforts during the Cold War (96). The five distinct chapters in his book that study various kinds of technology (satellites, ballistic missiles, gas centrifuges) in different institutional settings (EURATOM and ELDO) skillfully demonstrate the role of positive inducements and incentives to target states (as opposed to threats, blackmail, or sanctions) in U.S. nonproliferation policy. In other words, the implication of Krige’s work is two-fold: that technology-driven policy solutions were actively adopted by U.S. governments in the 1950s and 1960s, and that U.S. policymakers prioritized ‘engaging’ with the target state or the proliferator over and above punitive or coercive policies like technology denial and sanctions. Together the two challenge some of the assumptions prevalent in existing scholarship on nuclear proliferation. Despite the awareness of some scholars that incorporating technological factors could lead to a more comprehensive understanding of the causes and effects of proliferation, few studies have done so. The recent scholarly debate on long-term trends in U.S. nonproliferation policy also ignores technology-driven policy tools. It is perhaps understandable therefore, that we know more about U.S. coercive efforts at preventing proliferation—most of them political, military, and economic in nature—than about the non-coercive measures. Krige’s Sharing Knowledge, Shaping Europe is, therefore, a timely contribution to existing literature on nuclear proliferation and nonproliferation. He brings technology to the forefront of the discussion, and demonstrates how positive inducements played a key role in U.S. efforts to thwart possible nuclear weapons ambitions of states. Proliferation is a “nebulous concept” (158), writes Krige, because it is hard to control and hence needs continuous vigilance. He argues that instead of completely isolating the target state, the nonproliferation agent is best served by adopting policies that involve concurrent technology sharing (thereby creating asymmetric interdependence between target and agent) and systematic but limited technology denial (thus constraining the capabilities of the target). The nonproliferation agent’s “soft power” (4) facilitates its ability to cultivate such parallel technological relationships that can be constraining and bolstering at the same time. In my understanding, this concept is Krige’s most important contribution to the literature. He also brings to the fore the interagency disputes and Congressional pressures that led to counterproductive outcomes from the point of view of nonproliferation. Moreover, Krige has tried to represent the multiple stakeholders of proliferation and nonproliferation through a discussion of the industry, scientists, engineers and bureaucrats while at the same time focusing on states as the key actors. There are, however, two main weaknesses that need further analysis and discussion. First, Krige’s account explains U.S. nonproliferation policies toward industrially advanced states in Western Europe that were already in close Cold War alliance with overlapping priorities. We cannot be certain whether ‘positive disarmament’ would be possible toward adversarial proliferators. He agrees that “ancillary relationships” (154) help technological collaboration, which in turn makes the sharing and denial of technology possible. In other words, the United States needs to have access to the target state, preferably through existing interstate relationships. This implies that the technological substitution that Krige describes may only be applicable toward the small number of industrialized states that are in alliance with Washington. This is not a flaw but its current limitations of scope and applicability could have been more clearly laid out by the author. Second, in studying only the presidencies of Dwight Eisenhower and Lyndon Johnson, the book tells us little about President John F. Kennedy’s nonproliferation policy. Krige does not explain his choice of omission. Is it because ‘positive disarmament’ was not in action during the Kennedy era? If so, why was that the case? It makes us wonder if technological substitution was unique to two U.S. administrations or was applied by U.S. policymakers across several administrations. At a time when it is claimed in some quarters that nonproliferation is part of U.S. grand strategy with largely consistent policy priorities, it would be useful to know how consistent technology-driven policy tools figured in Washington’s nonproliferation efforts during the Cold War, and in present times. The above aspects can be easily addressed in future studies by the author himself or by those influenced by his work. The novelty of Krige’s work lies in relating technology with security, demonstrating how U.S. policymakers connected the two for nonproliferation, and how scholars ought to do the same for a more holistic understanding of U.S. policy against the spread of nuclear weapons. It is always interesting, and sometimes enlightening, when two very different disciplines of history make forays into one another’s turf. The history of diplomacy, rooted firmly in a tradition of political history, international relations, and more recently transnational approaches to the interchanges between states, makes frequent reference to technology when its topics touch on the late-twentieth century. But it rarely, at least in my experience, touches on the kinds of topics that are of interest to strict historians of technology. The history of technology is its own, distinct field of study, with its own professional society and annual meetings, and has its own set of particular questions and approaches it cares about, ranging from those who believe that one needs to understand the nitty-gritty of the technical matters in question to properly ask questions of it, to those who are concerned chiefly about the ways in which seemingly individual ‘technologies’ are simultaneously embedded in massive systems of production, and are also themselves the shapers of the world in the form of the infrastructure needed to use and maintain these technologies. Imagine the global production line that goes into the making of a single automobile, and then simultaneously imagine the kind of world required (roads, gasoline pumps, regulations and laws) to make automobiles a standardized means of transportation, and you have a bit of the way in which the historian of technology prefers to look at things. John Krige, who is very much a self-identified historian of technology, has in recent years done much to try and show what this worldview can bring to the study of diplomatic history. He has, simultaneously, tried to show historians of technology what diplomatic historians can bring to their own line of inquiry. His subject of choice for this is, quite naturally, the Cold War, that time when both technology and diplomacy were elevated to the existential heights from which they have not quite ever descended. 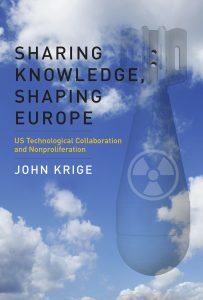 In his most recent book, Sharing Knowledge, Shaping Europe: US Technological Collaboration and Nonproliferation, Krige has written something of a transnational study of the history of technological diplomacy in the Cold War, centered around three major case studies. Chapters 1 and 2 focus on Euratom, the European Atomic Energy Community, a short-lived (1955-1958), contentious attempt by the United States to foster European integration, and European dependence on the United States, by sharing peaceful nuclear technology. Chapters 3 and 4 turn to efforts by the United States to achieve similar ends in the 1960s through agreements on the sharing of civilian rocket technology. Chapter 5 looks at the contentious American efforts to regulate uranium-enriching gas centrifuges in Europe. Taken together, these cases illustrate for Krige two main principles relevant to the study of technological diplomacy: First, that technologies themselves cannot be simply black-boxed as yet another kind of diplomatic matter to be hassled over—they have their own special properties that the history of technology can give insight into. Second, that technological interchange should be considered a form of ‘soft power,’ pace Joseph Nye, and its strategic ramifications should not be ignored by the historians of science and technology. American interests in European technological sharing were complex, as Krige amply documents. There was, especially in the 1950s, a belief that the U.S.-pushed supranational organizations that would be dedicated towards peaceful technologies would play a part in solving the old ‘European question,’ leading towards greater stability and less friction amongst old rivals and enemies, dissolving nationalism in a cauldron of scientific cooperation (2-3). But this was simultaneously joined by a nonproliferation motivation. Both nuclear energy and space programs were extremely high-cost ‘prestige projects’ that would require immense amounts of technical and material resources. If European countries were wrapped up in peaceful versions of these projects, American diplomats and experts reasoned, they would have a hard time diverting further resources towards the kinds of projects Americans found problematic, like national nuclear weapon programs or missile programs. Similarly, keeping European powers dependent (to some degree) on American expertise and raw materials would keep them somewhat hobbled in their full technological potential, and would allow easy American surveillance of their state-of-the-art technology. As the U.S. had found when it cut the British out of its nuclear collaboration in 1947, attempts at technological isolation could produce exactly the opposite effect (the British promptly began their own indigenous nuclear weapons program), and often served only to keep the Americans in the dark. Euratom was a particularly curious construction, nestled in the policy gap between Atoms for Peace, President Dwight Eisenhower’s 1953 plan to promote civilian nuclear technology abroad, and the 1968 Nuclear Non-Proliferation Treaty, which sought more rigorous controls on dual-use nuclear development. Euratom was meant, explicitly, to help steer European nations onto a peaceful nuclear path: it was clear to American analysts that many European nations could develop independent nuclear arsenals if they so desired a decade after the Manhattan Project had ended. At the same time, nuclear technology was capital intensive in every way possible. Holding out a ‘carrot’ of peaceful technology would give American diplomats more leeway in steering technological paths abroad, toward ones where Americans held more cards. (40) By promising, for example, that Europeans could share in American enriched uranium, this might, it was hoped, create a dependency rather than an independent capability. The situation with rockets followed a different trajectory (pun intended). Space programs, post-Sputnik, also seemed like an important prestige program carrot that could be held out to European nations. They were also ruinously expensive for states that attempted to carry them out on their own. To someone not versed in the technology, the difference between a space program and a missile program can appear to be subtle. But while they share some similar core technologies, there were more proliferation-resistant paths that could be encouraged by the United States (like liquid-fuel launchers, which make for less useful weapons), and ultimately the aims of the two are sufficiently different that a medium-sized state could not simultaneously invest in both at the same time. The United States considered space programs a form of ‘positive disarmament,’ which is to say, instead of disarmament being focused on stopping activity, space programs would ‘disarm’ by tying up so many resources in acceptable activities that little would be left over for military uses. (84-85) Ultimately, however, it was a tough sell. West Germany was only somewhat interested in a space program, while India found the resources to take advantage of U.S. space aid while also developing a nuclear program at the same time. This last case study is, in this reader’s mind, the most compelling and complex. The other two case studies follow a pattern that becomes apparent rather quickly: the United States tried to foster supranational cooperation on innocuous research in Europe, both because it helped build European unity and the European-American alliance, but also in the belief that it would keep them from using their technical base to develop problematic technologies. And in both the case of peaceful atomic energy and space programs, it only somewhat worked: the Europeans were aware of what was going on, they were aware of its risks, and they bent things a bit so it stops being quite as obvious who is manipulating who. There is, in these case studies, a nice demonstration of the technological ‘soft power’ that Krige is interested in, and in its limitations. The centrifuge case is a different matter. Here, the European countries had more leverage than the United States for once, because the technology did not in fact originate with the United States. There are also some interesting U.S.-UK complications, as the UK’s previous entanglements with the United States at times seemed to obligate them to not go their own way with European nations. But ultimately the U.S. buckled, allowing the European nations to develop a contentious technology on their own terms, because the alternative seemed to be sabotage of the Nuclear Non-Proliferation Treaty. And it is perhaps of note that some of the American fears did come to pass: lax security procedures at the Urenco enrichment plant in the Netherlands did, in fact, directly aid proliferation, in the form of Pakistani metallurgist A.Q. Khan, whose access to Dutch centrifuge blueprints as a young employee served as the basis of his efforts with both the Pakistani bomb program and his nuclear black market empire. It is tempting, when reading Krige’s book, to see many of the American actions as being counter-productive. That is, while Krige amply documents that these diplomatic and scientific actors saw their offers of technological collaboration as a form of ‘soft power,’ and even a form of ‘positive disarmament,’ the sum of his cases is really a demonstration of its limitations. The problem, perhaps, is that many people can play the ‘soft power’ game: it is soft because it is subtle, but the European nations have always been good at playing subtle games as well. In Krige’s book one can see the fallacy of the belief that American technological superiority let it call all the shots: it gave some leverage, but ultimately it had fairly severe limits. Multidisciplinary work poses a number of challenges for author and reader alike, and I thank my three reviewers for engaging so generously with a text that, as Alex Wellerstein points out, involves the intersection between “two very different disciplines of history.” I would even say three, the history of technology, the history of European integration in the early Cold War, and security studies. My main aim in this book was not simply to foreground the role of technology in policy making, but to show how technological options define policy options. In line with calls by Walter Lafeber, Odd Arne Westad and others to treat technology as more than just a backdrop to foreign policy,  I emphasize that technological innovation makes distinct social choices possible, though just what those choices are depends on the details of the technology itself and the social context in which the choice is made. My social actors in the government were aware of those details, and used them to exploit U.S. technological leadership as a diplomatic instrument of soft power. As all three reviewers stress, techno-diplomacy provided successive administrations with a ‘carrot’ they could use to promote non-proliferation as opposed to the ‘sticks’ of blackmail, economic sanctions, or military intervention that dominate the debate in the U.S. today on how to deal with ‘rogue states.’  They highlight the concept of “positive disarmament” so-named by Vice-President Hubert Humphrey (84). It amounted to a policy of technological substitution in which the U.S. took advantage of its technological pre-eminence to help states develop civilian programs at the expense of military ones. This was proposed in the 60’s in Western Europe, but also in India and to Japan after the Chinese nuclear test in 1964. I would stress, a little more than my reviewers, that this imaginative, if hubristic, idea faltered mostly because it required close interagency collaboration (between the State Department, and the Atomic Energy Commission (AEC) and the National Aeronautics and Space Administration (NASA, depending on the case). This intimacy was simply impossible to achieve, due mostly to fears of technological leakage. The exercise of ‘soft power’ proved far less effective in key strategic fields than its main protagonists had hoped. Jayita Sarkar regrets the absence of any reference to the Kennedy administration. That absence arises because my argument is structured around the diplomatic possibilities raised by technological innovation, rather than being shaped by the exigencies of historical narrative. Non-proliferation politics during Kennedy’s time in office were dominated by the efforts to develop a concept of a multilateral nuclear force that would satisfy West Germany’s aspirations. My problematic is different. It is perhaps most evident in the study of the European Atomic Energy Community (EURATOM). These two chapters differ from existing scholarship by emphasizing the technological enthusiasm surrounding peaceful nuclear power at the time, an enthusiasm that was gradually whittled away as the limits of the technology emerged, and which is fundamental to explaining the political choices made both in Europe and in Washington. As with my discussion of ELDO (the European Launcher Development Organization) in the mid-1960s, my aim is not only to stress the considerable effort the State Department invested in enrolling other relevant agencies in a program of technological sharing with these fledgling European institutions. It is also to highlight the place of technological collaboration around complex and costly technological platforms as a deliberate strategy promoted in Washington to ground European integration and to undercut the proliferation of both nuclear and missile capabilities. Ori Rabinowitz, and indirectly Wellerstein, are not the first of my readers to be disappointed by the chapter on the European missile/rocket program undertaken by ELDO. Where I part company with them (and much work in security studies) is in insisting that we place as much weight on missile proliferation as we do on nuclear proliferation in the early Cold War, as did National Security Adviser McGeorge Bundy in NSAM294 (108). This lacuna in the literature partly explains my analytical weakness as discussed by Rabinowitz. What I did, though, is ground my analysis squarely in how Under-Secretary of State George Ball defined the problem, and specifically in how he mapped technical distinctions (in rocket fuels) onto divergent technical choices (space launchers versus guided missiles) and onto quite different institutional organizations (multi-national versus national) (98). Technology shapes diplomacy—more precisely, technological possibilities and distinctions help define diplomatic alternatives—, not the other way round. I share Rabinowitz’s regret that I did not engage more with current literature that draws strong correlations between technological collaboration and nuclear proliferation. That was partly because my dominant theme, announced in the title, prioritized European integration over security studies as the main, though not exclusive, focus of the book. Be that as it may, the work by Matthew Fuhrmann, Matthew Kroenig, and Jacques Hymans that she cites is obviously important in that it highlights the fact that a nuclear program is a dual-use technological system that includes raw materiel, hardware, nuclear know-how, multiple technical skills, and management capacity—all over and above the usual variables of political will and security threats needed to get leaders to choose the weapons option. That said, I disagree entirely with the teleology and technological determinism (as well as the orientalism) that infuses some of these analyses. A separate article is needed to develop these remarks. Consider though the implicit slippage in Fuhrmann’s argument that “peaceful nuclear assistance reduces the expected costs of a weapons program, making it more likely that a decision to begin such a program will be made” (my emphasis). The assumption that ‘if one can, one will,’ especially if there is a security threat, is supported by potted histories (e.g. of the India case) that push the temptation to embark on a weapons program back to the moment one has the technology to do it, and that are caricatures of complex situations. Unsupported claims that “atoms for peace become atoms for war” play into the hands of those calling for technological denial, economic isolation, and even pre-emptive or preventative attacks on putatively civil programs. Technological collaboration reduces costs for the target state, so removing one material impediment to developing a weapons program, as Fuhrmann rightly points out. But it also enhances the donor’s political influence. It can be a tool of ‘positive disarmament.’ It is a mode of informal intelligence gathering, as Wellerstein reminds us. The transnational circulation of knowledge enables the U.S. scientific elite to build close interpersonal bonds with colleagues abroad, bonds that are both a source of information, and an aid to refashioning values towards the U.S. and its pursuit of non-proliferation goals. It is, after all, thanks to the efforts of Los Alamos National Laboratory director and weapons scientist Sieg Hecker that we know so much about North Korea’s centrifuge program: contra Sarkar, technological collaboration is possible with “adversarial proliferators”, and positive disarmament may be a very productive way of dealing with North Korea today. Perhaps we should try, or try harder. One policy implication of this book is that it is a serious mistake to present technological denial and technological collaboration as polar opposites as regards national security. There are pros and cons to both. Collaboration reduces a state’s financial costs of embarking on a weapons program. But denial and sanctions also reduce costs to target states, political ones—states are tempted to proliferate in a confrontational context because there is “nothing further to lose.” Weapons programs are “massive systems of production” (Wellerstein) with multiple interlocking ‘parts’ and components. The challenge lies in knowing what can be shared to secure access, even if it reduces financial costs to the recipient, and what must be denied to impede proliferation, without sacrificing trust. The American weapons laboratories make these kinds of technological decisions every day, in the name of national security. Scholars need to be equally sophisticated. For example, consider the programs established in Iraq and Libya. See Målfrid Braut-Hegghammer, Unclear Physics: Why Iraq and Libya Failed to Build Nuclear Weapons (New York: Cornell University Press, 2016). Recent studies include: Francis J. Gavin, “Strategies of Inhibition: U.S. Grand Strategy, the Nuclear Revolution, and Nonproliferation,” International Security 40:1 (Summer 2015): 34-35; Nicholas L. Miller, “Nuclear Dominoes: A Self-Defeating Prophecy?” Security Studies 23:1 (2014); Gene Gerzhoy, “Alliance Coercion and Nuclear Restraint,” International Security 39:4 (Spring 2015): 91-129: William Burr, “A Scheme of ‘Control’: The United States and the Origins of the Nuclear Suppliers’ Group, 1974-1976,” The International History Review 36:2 (2014): 252-276. See Matthew Fuhrmann, “Spreading Temptation, Proliferation and Peaceful Nuclear Cooperation Agreements,” International Security 34:1 (Summer 2009): 7-41; Matthew Kroenig, “Exporting the Bomb: Why States Provide Sensitive Nuclear Assistance,” American Political Science Review 103:1 (February 2009): 113-133. Jacques E. C. Hymans, “Botching the Bomb: Why Nuclear Weapons Programs Often Fail on Their Own—and Why Iran’s Might, Too,” Foreign Affairs (May/June 2012). Alexander H. Montgomery, “Stop Helping Me, When Nuclear Assistance Impedes Nuclear Programs,” Chapter 7, in Adam N. Stulberg and Matthew Fuhrmann (eds. ), The Nuclear Renaissance and International Security (Stanford: Stanford University Press, 2013), 177-201. John Krige, “The Proliferation Risks of Gas Centrifuge Enrichment at the Dawn of the NPT,” The Nonproliferation Review 19:2 (2012): 219-227; Krige, “Hybrid Knowledge: The Transnational Co-Production of the Gas Centrifuge for Uranium Enrichment in the 1960s,” The British Journal for the History of Science 45:3 (2012): 337-357; Krige, American Hegemony and the Postwar Reconstruction of Science in Europe. Transformations, The MIT Press, 2006. See for instance, Scott D. Sagan, “The Causes of Nuclear Weapons Proliferation,” Annual Review of Political Science 14 (2011): 225-44; Scott D. Sagan, “Nuclear Latency and Nuclear Proliferation”, Chap. 5, in Forecasting Nuclear Proliferation in the 21st Century, edited by William Potter and Gaukhar Mukhatzhanova (Stanford: Stanford University Press, 2010) 80-101. Francis J. Gavin, “Strategies of Inhibition: U.S. Grand Strategy, the Nuclear Revolution, and Nonproliferation,” International Security 40:1 (Summer 2015): 9-46; Or Rabinowitz and James Cameron, “Eight Lost Years? Nixon, Ford, Kissinger and the Non-Proliferation Regime, 1969-1977,” Journal of Strategic Studies (2016): 1-28; Nicholas L. Miller, “Nuclear Dominoes: A Self-Defeating Prophecy?,” Security Studies 23:1 (2014): 33-73. Nicholas L. Miller, “The Secret Success of Nonproliferation Sanctions.” International Organization 68:4 (2014): 913-944; Gene Gerzhoy, “Alliance Coercion and Nuclear Restraint: How the United States Thwarted West Germany’s Nuclear Ambitions,” International Security 39:4 (Spring 2015): 91-129. Tristan A. Volpe, “Atomic Inducements: The Case for “Buying out” Nuclear Latency,” The Nonproliferation Review 23:3-4 (2016): 481-493. The work of the prolific and seminal Thomas P. Hughes is generally a good place to start if one is interested in thinking like a ‘big systems’ historian of technology, e.g. Rescuing Prometheus (New York: Pantheon Books, 1998) and American Genesis: A Century of Invention and Technology Enthusiasm (Chicago: University of Chicago Press, 2004). I would be remiss to not point out that while the history of science and technology are often overlapped, historians of science broadly tend to be more concerned with the epistemological than are the historians of technology, who are more concerned with the infrastructural. Those unfamiliar with Krige’s work should look at John Krige, American Hegemony and the Postwar Reconstruction of Science in Europe (Cambridge and London: The MIT Press, 2006); John Krige, “Atoms for Peace, Scientific Internationalism, and Scientific Intelligence,” Osiris 21:1 (January 2006): 161-181; and his recent edited volume: Naomi Oreskes and John Krige, eds., Science and Technology in the Global Cold War (Cambridge and London: The MIT Press, 2014). Joseph S. Nye, Jr., Soft Power: The Means to Success in World Politics (New York: Public Affairs, 2004). Walter Lafeber, “Technology and Foreign Relations,” Diplomatic History 24:1 (2000): 1-19; Odd Arne Westad, “The New International History of the Cold War: Three Possible Paradigms,” Diplomatic History 24:4 (2000): 551-565. Techno-diplomacy is an adaption of Gabrielle Hecht’s term ‘techno-politics’ from a national to an inter-national context. See, for example, Gabrielle Hecht and Paul N. Edwards, The Technopolitics of Cold War (Washington, D.C.: American Historical Association, 2007). Matthew Fuhrmann, “Spreading Temptation: Proliferation and Peaceful Nuclear Cooperation Agreements,” International Security 34:1 (2009): 7-41. See, for example A. Vinod Kumar, “Between Idealism, Activism and the Bomb. Why did India Reject the N.P.T. ?”, in Roland Popp, Liviu Horovitz, and Andreas Wenger, eds., Negotiating the Nuclear Non-proliferation Treaty. Origins of the Nuclear Order (New York: Routledge, 2017): 137-160. C. Courtney Lawrence, “Normalization by Other Means. The Failed Techno-diplomacy of Light Water Reactor Export in the North Korean Nuclear Crisis,” unpublished article. Itty Abraham, “Who’s Next? Nuclear Ambivalence and the Contradictions of Non-proliferation Policy,” Economic and Political Weekly 45:3 (2010): 48-56. National Academies Complex, Balancing Scientific Openness and National Security Controls at the Nation’s Nuclear Weapons Laboratories (Washington D.C.: National Academy Press, 1999). Next Next post: Policy Series: A Double Standard?